by Dave from The Longest Way Home ~ July 22nd, 2013. Updated on September 6th, 2017. Published in: Travel blog » Nepal » Photography. There’s really no doubt that this Kumari photograph is going into my main photography gallery. It was one of those events that meant a lot to me personally rather than purely for a “photographs” sake. If you’d like to find out more about the Kumari then check out the links at the bottom for the series. Meanwhile here are some highlights and facts. 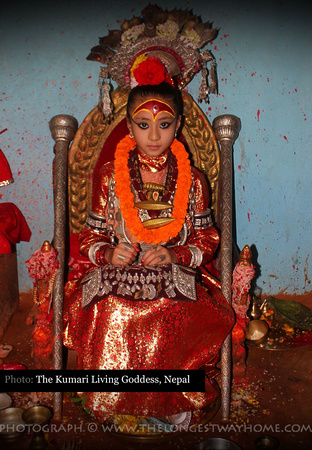 The Kumari are prepubescent girls of Hindu faith from Nepal. 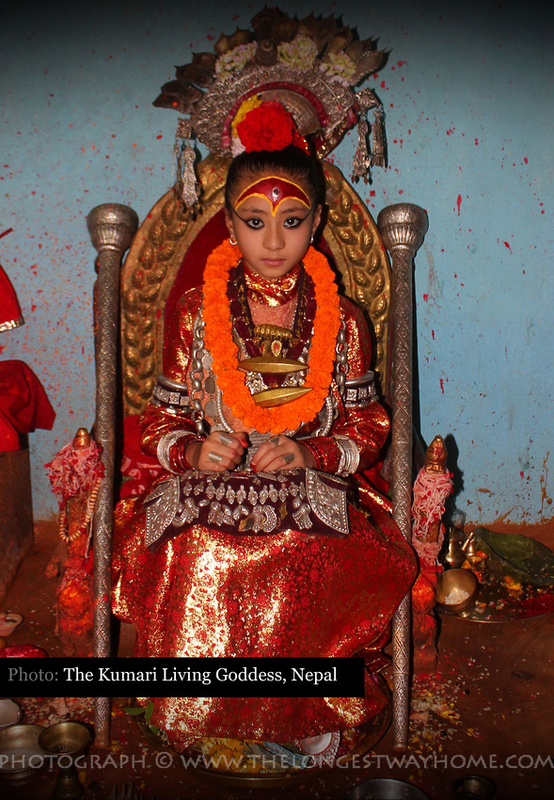 They are believed to be the living incarnation of the goddess Taleju by the Newari people. There are several Kumari’s in Nepal, however they are ranked. The Kathmandu Kumari comes first, then Bhaktapur then Patan. The Goddess Taleju leaves the girls body upon menstruation. The Kumari never leave their homes unless for official occasions. I’ve already documented this in a series of articles. However as a recap in 2007 I’d heard of the Kumari but was not able to visit her. Upon returning to Nepal I made this a priority. Along the way spending time with people in Kathmandu, Bakthapur and Patan on my search. However once I did find and meet with the Kumari I was taken back by own discoveries. From a revered symbol to simply being confronted by a little girl called Samita I found something much better than just a photograph. There are plenty of tour companies in Nepal trying to profit on the Kumari tradition. You do not need to pay to visit the Kumari! The tour companies do not give these excessive profits to the Kumari family at all. You can visit the Kumar easily and independently. Planning on booking a hotel room soon? This one. it’s very striking! Amazing capture. Just read through part of her story. Really incredible that there are still things like this in the world today! I’ll say it again – I’ve not seen anything like her before. Almost like a fantasy world. Perhaps that’s where movie makers get their ideas? I really enjoyed your previous unwrapping of the Kumari Legend. Go with this photo as it seems to be your fav! I think that’s the way it will go! It’s my favourite photo on your site. Even though the story means a lot to you personally, it doesn’t take away from the fact that this is a great photo. Cheers Nate, nail on the head there! It belongs in a magazine. Can’t stop looking at it to be honest. Such a great story too. Well done Dave! Thanks Claire, kind of you to say so. I’m really curious- we stumbled upon the Kumari, peeking down from her window to a courtyard filled with American tourists. And it was the girl we’d seen in your pictures. Interestingly there were many postcards of the “Kumari” for sale and most showed different girls- in Kumari guise. I wonder, were these all “Kumaris past”? Or girls dressing up like Kumaris, as in a “casting”?? There are three main Kumaris. The postcards may have featured one of the three different ones. Or, quite simply the postcard may be old stock from Kumaris of the past. Hard to tell without actually seeing the postcards myself!